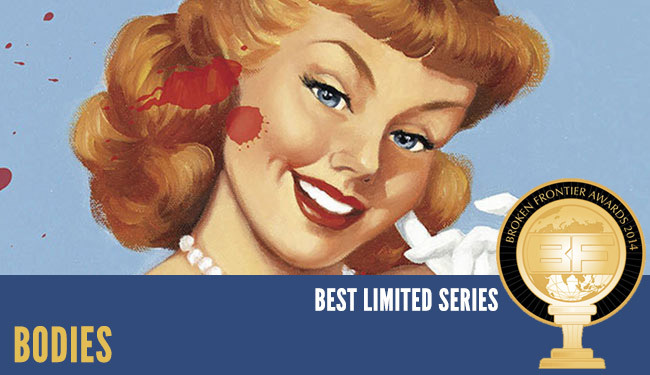 A complex occult mystery spanning four periods with four different artists, Bodies shows that Vertigo hasn’t lost its appetite for taking a risk. With most of the creator-owned thunder currently emanating from Image, it might come as a bit of a surprise that this winner has come from Vertigo – an imprint that has lost out as much as any to that seemingly unstoppable publisher in recent years. 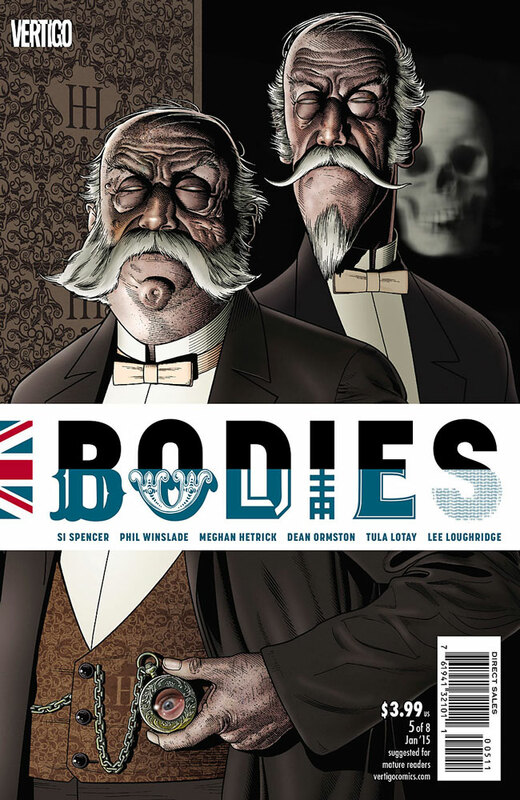 However, with a sense of history repeating itself that resonates with the temporal shenanigans contained within its pages, this year’s Best Limited Series, Bodies, is a complex and strongly authored series marshalled by a British writer. But this time round it’s not Moore, Milligan or Morrison, but Si Spencer, whose Hellblazer: City of Demons and Vinyl Underground series for the same publisher ploughed a similar furrow through London’s rich occult heritage. The concept at the heart of Bodies apparently came to Spencer in a dream: “four time periods, four detectives, four murders: same MO, same location, same victim… someone’s being murdered — forever”. That pitch is then mapped onto the format of the comic: each issue features a six-page episode from each of the eras, crafted in an highly individual style by a different artist while still knitting together the bigger picture. With its backbone of murders in East London linked across the centuries, Bodies owes at least a nod to Peter Ackroyd’s highly influential novel Hawksmoor. However, it’s certainly not the first time Ackroyd’s themes have been teased into comics form, and Spencer doubles down by cutting his narrative across four vividly depicted eras and four detectives who certainly are not all they seem. So, in 1890, with the wounds of the Whitechapel murders still raw, we have Edmond Hillinghead trying to push the police force into a more scientific mode of detection while concealing his own homosexuality. In chaotic Blitz-torn 1940, “Charles Whiteman” is a Polish emigré hiding both his past and his own ruthless criminal activity. Moving into the twenty-first century, 2014 brings us Shahara Hassan, a fast-tracked female Muslim detective in an increasingly xenophobic society, hiding the strength of her faith behind the ‘banter’ required by the job. Then, in a dislocated 2050, the dreamy amnesiac Maplewood remains hidden from herself by the mysterious mind-scrambling effects of the ubiquitous but as-yet-undefined “Pulsewave”. For all its complexity, Bodies actually requires its biggest suspension of disbelief on the first page, with the notion that the present-day Metropolitan Police would take robust action against right-wing extremists, rather than “kettling” and intimidating the anti-fascist protesters who stand against them. However, that opening scene cements the location, as well as the notion that London’s centuries-deep social strata have been formed by wave after wave of immigrants – a key theme that is played out across the complex narrative (along with recurring images and phrases that weave together the temporal cat’s cradle supporting the story). Spencer’s energetic dialogue and narration, packed with pithy and authentic-sounding period touches, create a strong sense of time and place, backed up by the inspired choice of artist for each segment. 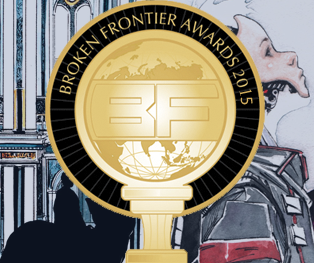 Dean Ormston embellishes 1890 with a suitably gothic atmosphere; Phil Winslade creates gritty London noir for 1940; Meghan Hetrick gives the present day a high-def, high-tech gloss; and Tula Lotay (also the winner of this year’s Broken Frontier Award for Breakout Talent) captures perfectly the dreamlike psychic miasma of Maplewood’s 2050. It’s worth mentioning here that the book’s success should also be attributed in no small part to colourist Lee Loughridge (a nominee in our Colourist of the Year category), whose intelligent, sensitive work gives each strand of the story its own identity, from the near-monochrome and chilling red accents of Victorian London to the trippy cyberdelia of post-Pulsewave 2050. 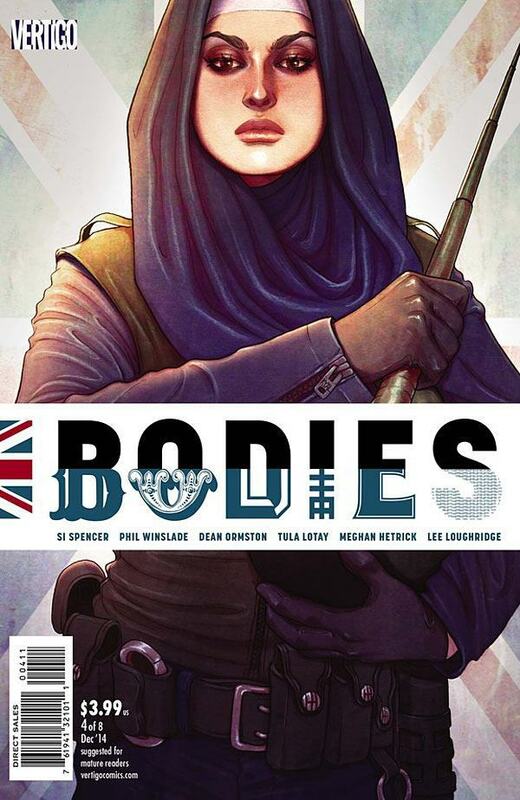 With the addition of covers by a small army of comics’ finest (including Brian Bolland, Paul Pope and Jenny Frison), it’s clear that this is an example of comics at their collaborative best. However, at the heart of it is writer Si Spencer, being allowed to do a juggling act on the tightrope with no safety net. For that alone, in an industry often characterised by risk-averse give-them-what-we-think-they-want editorial decisions, Bodies deserves all the plaudits it gets.